If, like me, you love Diana’s fiction, and you wish to learn more about the person, who she was and how she thought, then this book will enlighten you. But it will give you more than that. Her writings assembled in our place tell us how she thought about literature and the reasons for literature, about the place of children’s fiction in the world, about the circumstances that shaped her and her own understanding and vision of who she was and what she did. It is ferociously intelligent, astonishingly readable and, as with so much that Diana Wynne Jones did, she makes each thing she writes, each explanation for why the world is as it is, look so easy. 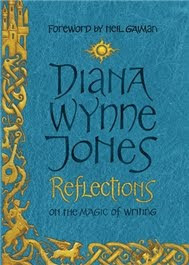 Reflections On the Magic of Writing collects twenty-eight pieces – mainly essays, lectures and papers – that Diana Wynne Jones wrote between 1978 and 2008 and presents them chronologically. In addition to the foreword by Neil Gaiman, Reflections also includes an introduction by Charlie Butler and a moving interview he conducted with her in February 2011, when her illness was quite advanced, and two pieces written by her sons after her death. But as interesting as this supplemental material is, of course that what makes Reflections so great are Diana’s own pieces. Reading them is like getting to know her and to spend time with her, and the person you glimpse in these writings is exactly the person you’d have imagined from her books. Diana Wynne Jones comes across as fiercely, almost intimidatingly intelligent; except, as Neil Gaiman so well puts it, she makes every insight or perfectly worded comment look so easy. There’s also her wonderful sense of humour, which, much like in her fiction, she generously intermingles with serious points. There’s a certain amount of repetition in Reflections, as she herself warns readers in the introduction, but in essays spanning so many years that’s only to be expected. I read the book slowly enough that I didn’t mind, and in the end I even came to appreciate the consistency of her ideas (as well as all the little ways in which we see them evolve). In 1970, no boy would be seen dead reading a book whose hero was a girl. Children were then – and still are to some extent – rather too inward with the heroic tradition that heroes are male and females are either wimps or bad. Girls will read male-hero stories and (wistfully) identify, but not vice-versa, not in 1970 anyway. I took this up rather as a challenge: I love a challenge. For instance, I made David in Eight Days of Luke a boy, but I put him in a situation with his relations that both sexes could identify with. In Power of Three, I provided Gair with a sister with apparently greater gifts, and the same in Cart and Cwidder; and I sneaked a female hero past in Dogsbody by telling the story from the dog’s point of view. But a desire was growing in me to have a real female hero, one with whom all girls could identify with and through that, all persons – a sort of Everywoman, if you like. This is the reason for the name Polly, when I eventually came to write Fire and Hemlock. Reading this actually made me a little sad for a moment, because part of me wanted her to go further; to actually say, “I will write about a girl if I want to; screw having to ‘sneak her past’ readers!” But when I read it in the context of other essays about her experiences writing for children back then, of course I don’t resent her – I know that being able to afford to defy rules of this kind is something we owe to those who came before us, and Diana Wynne Jones was certainly one of them. Baby steps, right? Also, it’s interesting to consider that we’re still having these conversations so many years later. Considering these arguments historically is illuminating, and it makes it all the more upsetting to see girls’ points of view referred to as “an overused trope” these days. There was another kind of double thinking going on at the tennis too, at least among the commentators. If a male player hit the ball into the net when he didn’t need to, they went, ‘Oh, what an appalling shot to play at this stage in the game!’ But if a female player did it, it was, ‘Oh well, women are expected to make mistakes.’ I was pretty indignant about this, until I realised that the women players didn’t actually make many unforced errors. The commentators’ expectations were years out of date. The women’s expectations about themselves had changed. It is one of those many fields where feminism has made an enormous subtle difference. Exactly the same change has come about in children’s books. About ten years ago, boys started being prepared to read books with a female hero. I found everything had gone much easier without, then, being able to say how or why. Females weren’t expected to behave like wimps and you could make them the centre of the story. By that time anyway, I found the tactile sense of being female had stopped bothering me – which may have been part of the same revolution – and it was a real release. I wrote The Spellcoats, told by a girl, and The Time of the Ghost, told from the point of view of a female ghost, and then – although this one has only just been published - Black Maria, which explores the traditional roles of the sexes. After that, with a feeling that this was the big one, Fire and Hemlock. But with me they have the backing of all other posers of the [why fantasy] question, from my mother-in-law on: females shouldn’t really be doing this. This is particularly noticeable when, as quite often happens, one of my books is reviewed alongside a book by a male writer. He, being a man, is assumed to have powerful motives for writing fantasy for young people (for who otherwise would?) and the delicacy and power with which he conveys his message is most seriously gone into. The felicities of his language are remarked on and praised. Then the reviewer passes on to me: Jones always does this sort of thing – it’s in her chromosomes, she can’t help it – take no notice – but really, as a woman, she should stop being clever. My brain hurts. I think the hidden but constant assumption that, as a woman, I can’t help writing for children because it is a by-product of my natural function as a mother, and therefore as meaningless as a lullaby or a nonsense-rhyme, is the one I probably resent most. Actually my Pig of the Year Award went to the male reviewer of Fire and Hemlock. I quote it here in full: ‘This is a girls’ book and I don’t see why I should try to understand it.’ End review. I desperately want to think that a review this overtly sexist and dismissive wouldn’t be published today, but I’m really not sure. And even if so, these days we ignore women’s writing instead, which isn’t exactly better. Crossing the Sea is represented as a matter full of sadness, and Cirdan the shipwright is given many attributes of a priest, and the passing of Frodo is never represented as other than a permanent voyage. So the ending is heart-rendingly equivocal. You can see it as Frodo moving into eternity, or into history – or not. You can see it as a justification – or not – of the negative side. In fact, we are experiencing the proper mode of Romance which was signalled right from the start. The values of the people who wrote Romances never seem quite the same as our own. This kind of equivocal ending where winning and failing amount of the same, Arthur passes to sleep on a hill, and a gift exacts its price, is exactly what should have been expected. You Were Warned. For good measure, you knew that life never comes round to a happy ending and stops there. There is always afterwards. But such was the skill with which this narrative was shaped that you could not see the pattern, even when it was constantly put before you. Yes, there really was nothing about narrative that Tolkien didn’t know. Diana Wynne Jones fans! You seriously need to read this book. And you, you who are interested in writing or in fantasy or in children’s literature – you too. You have to remember that villains are real people too. They have reasons for what they do, and motives for the way they behave, and they do not, as a rule, regard themselves as evil. They are acting for a cause, or out of deeply held convictions which have led them the wrong way. A lot of writers forget this. They make the baddie give evil laughs and rejoice in his/her wickedness – or worse, they wriggle out by making the villain mad. And they have the villain with no outside life except to torment the hero. The majority of bad people are not like this. It is much better to consider them as just like other people, but nasty. ‘Why do I write for children?’ There is a good reason. I would hope to encourage some part of one generation at least to use their minds as minds are supposed to be used. A book for children, like the myths and folk tales that tend to slide into it, is really a blueprint for dealing with life. For that reason, it might have a happy ending, because nobody ever solved a problem while believing it was hopeless. It might put the aims and the solution unrealistically high – in the same way that folk tales tend to be about kings and queens – but this is because it is better to aim for the moon and get halfway there than just to aim for the roof and get halfway upstairs. The blueprint should, I think, be an experience in all the meanings of that word, and the better to make it so, I want it to draw on the deeper resonances we all ought to have in the other side of our minds. Fantasy certainly does provide comfort – and who is not entitled to a little comfort if they can get it? For those who need that, it is the mind’s perfect safety valve. But a child reading, say, a fairy story is doing a great deal more. Most fairy stories are practically perfect examples of narratives that fit the pattern of the mind at work. They state a problem as a ‘what if’ from the outset. Huge thanks to the lovely Kristen, who very kindly sent me this book. This sounds like an eclectic and interesting mix. Great suggestion! I just can't believe I still have not read any of her books. She must make January's reading!!! This book sounds awesome beyond awesome. Your post certainly was...you made me feel all kinds of ways--from blood-boiling frustration to teary-eyed wonder. (And of course, you know I don't mean *you* made my blood boil, right? :P ) Yep, want to read this one, oh yes I do. The bit you quote about the ending of LOTR is so exactly right it makes me want to read the rest. I keep thinking about my reactions as a mother who wanted books and movies that would interest my young son in fiction, one who was growing up with an older sister and two older girls who were like sisters. There never seemed to be anything just for him. Maybe that was merely the swing of the pendulum. Trisha: I think the academic in you would especially enjoy it. Debi: Yes she must! You know I especially want you to read Fire & Hemlock, but there's hardly any chance of going wrong with her, so feel free to start anywhere! Jeanne: Isn't that quote spot on? About boys, I try (though sometimes I fail) to be careful not to underestimate the struggles of parents/teachers/librarians who want to find stories for young boys and have a world of societal expectations to content with. Sometimes no amount of goodwill will get them to pick up a book they KNOW the whole world will shame them for reading, because they're smart and watch the world around them intently. Still, all we can do is try, a little bit at a time. Kelly: I remember how much you enjoyed Jane Yolen's essay collection - these are similar and right up your alley too. Oh I bet reading this book was candy for the soul for you! I am so glad to hear that you enjoyed it to the fullest. I'm not overly familiar with the author's work, so this one probably wouldn't be the right pick for me, but I am so glad that you (and Gaiman) loved it!! I have yet to encounter Jones, but I look forward to doing so. And this collection sounds fascinating, especially in context of the idea of baby steps—Jones might not be as progressive as readers hope, but she still makes some progress. Huh. Clare: It's especially interesting to see some of that progress within this collection itself. Also, you HAVE TO READ HER FICTION! Oh Ana, you're right! I really must read this. I'm sad to say I only discovered DWJ this year, but I have been quick to fall for her charms, and know that when I one day have children of my own they will be introduced to her much sooner. I believe that it does take an incredibly intelligent writer to make things seem as effortless as Jones does, and I would love to see more of the mind behind her books as well as her thoughts on writing fantasy for children. I really am looking forward to her thoughts on fantasy writing especially, and writing for children, since she is one of the main writers who was able to bring children's lit into the main as writing for everyone to enjoy. She also was one of the few writers my son would read when he was young (the Christomanci series), so I would love her just for that. I've read many of her books and love her in general. So really, this book is a must for me!! I'm glad it lived up to your hopes for it and that you really enjoyed it, Ana. I have not read any of her books, but I really enjoyed reading this post and I'm so glad that you enjoyed the book! Oh how I covet this book! And the cover looks like it is such a vivid blue. Diana Wynne Jones was a smart cool lady, and I am sad every time I think about her that she won't be writing any more books. This sounds *amazing. * It's already on my TBR list, but you're making me want to get to it sooner than I had planned! I need to read this! Although I obviously also still need to read so much of DWJ's fiction. Perhaps I can covet this while I try to read a few more books before I turn to this one?